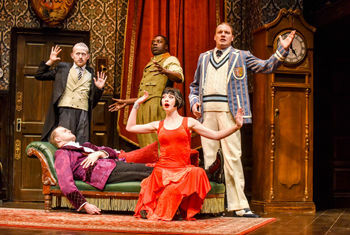 The Play That Goes Wrong, the West End’s Olivier Award winning box office hit, sets off on its third major UK tour, visiting a whopping 37 venues nationwide. Back on the road, following the phenomenal success of its sell-out 2017 tour, the 2018 UK tour arrives at the Alhambra Theatre, Bradford for one week only from Monday 18 June. Winning eleven international awards, including the 2015 Olivier Award for Best New Comedy and a 2017 Tony Award for its Broadway transfer, The Play That Goes Wrong continues to play to sold out houses in the West End, whilst enjoying its new status as Broadway’s longest running play. It is a remarkable rags-to-riches story for a play, which started its life at a London fringe venue with only four paying members of the public at the first performance, and has since played to an audience of almost one and a half million worldwide. In 2017, The Play That Goes Wrong played simultaneously in twelve countries. The touring cast includes Huddersfield born Gabriel Paul (Trevor), Bobby Hirston (Max) from Pontefract, Jake Curran (Chris), Catherine Dryden (Annie), Benjamin McMahon (Dennis), Steven Rostance (Jonathan), Kazeem Tosin Amore (Robert), Elena Valentine (Sandra) with David Kristopher-Brown (Understudy), Laura White (Understudy), Liam Horrigan (Understudy) and Louisa Sexton (Understudy). Mischief Theatre was founded in 2008 by a group of graduates of The London Academy of Music and Dramatic Art (LAMDA) and began as an improvised comedy group. Their other production The Comedy About A Bank Robbery is now booking into its third year in the West End at the Criterion Theatre and their new improv show Mischief Movie Night opens in the West End on 13 December at the Arts Theatre. In December 2016, Mischief made their TV debut on the BBC with Peter Pan Goes Wrong, starring David Suchet as the guest narrator. Peter Pan Goes Wrong (Olivier Award Nominee 2016) also enjoyed two sell-out West End seasons and a UK tour. Mischief returned to BBC One in December 2017 with a brand new Christmas Special, A Christmas Carol Goes Wrong, featuring guest appearances from Sir Derek Jacobi and Dame Diana Rigg and watched by a TV audience of 4 million. The company is led by Artistic Director Henry Lewis and Company Director Jonathan Sayer.